Join us on Sunday of Memorial Day Weekend from 1:00 to 3:00 p.m.* to honor both current and former members of the military and other patriots engaged in the Ruck To Remember. Approximatl120 patriots will march 60 miles from Harper’s Ferry, WV to Section 60 of Arlington Cemetery, the final resting place of the men and women who made the ultimate sacrifice in America’s most recent wars. 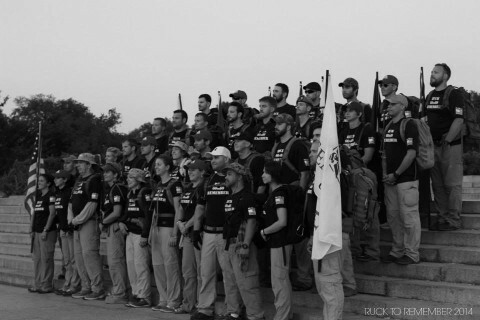 The “ruck” or trek brings the patriots along the W&OD Trail where they will stop at Old Ox Brewery for 2 hours to rest and share Stories of Valor. A Mission of Remembrance – An Operation To Honor & Empower. Patriots (just like you) from all over the country descend into our Nation’s Capital – joining a team of humbled Patriots – Trekking from Harpers Ferry, WV over rugged terrain and down into Washington DC in the early hours of Memorial Day morning – for a final sunrise RUCK over Memorial Bridge into Arlington National Cemetery (section 60). The 60 to 60 is not just an event – it’s a Mission to raise awareness and highlight the strength, commitment of our war-fighters and unite the Country with our mission and the sacrifice of our war-fighters. Learn more about Ruck To Remember here. *Arrival and departure times are approximate.